It was an innocent mistake, to think I could knock out 3 Scout tees in a day. What could be so hard about side seams and a teensy FBA with set in sleeve? 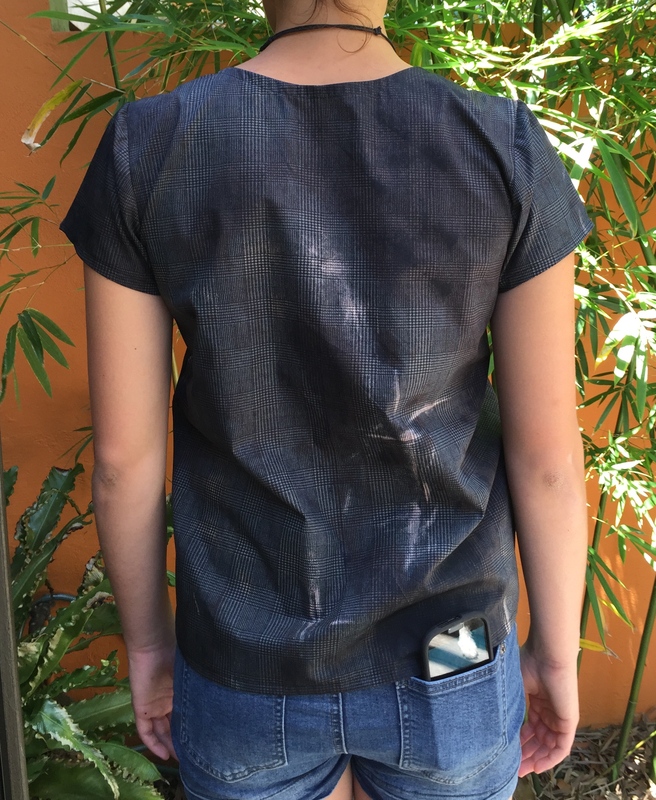 I was the only sewist in the entire universe who hadn’t made a Scout tee by Grainline. Recent posts on my feed bore testament to this fact. There was Kirsten of fifty two fancies from Wellington NZ with her dandy little numbers – 1 in bamboo knit and 1 in gingham broderie anglaise woven. 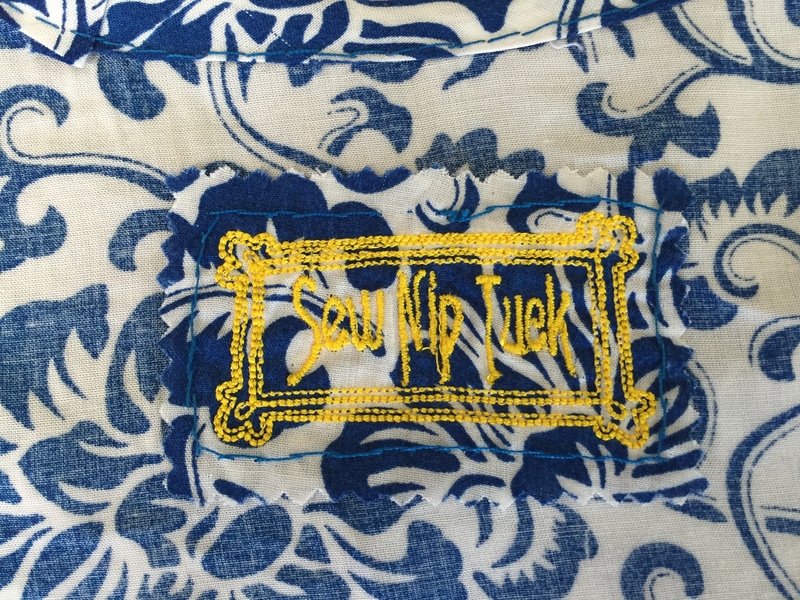 Not to mention Felicia’s well documented love affair with her Scout Tees in Nani Iro fabrics. I was feeling like the only kid not invited to a party. 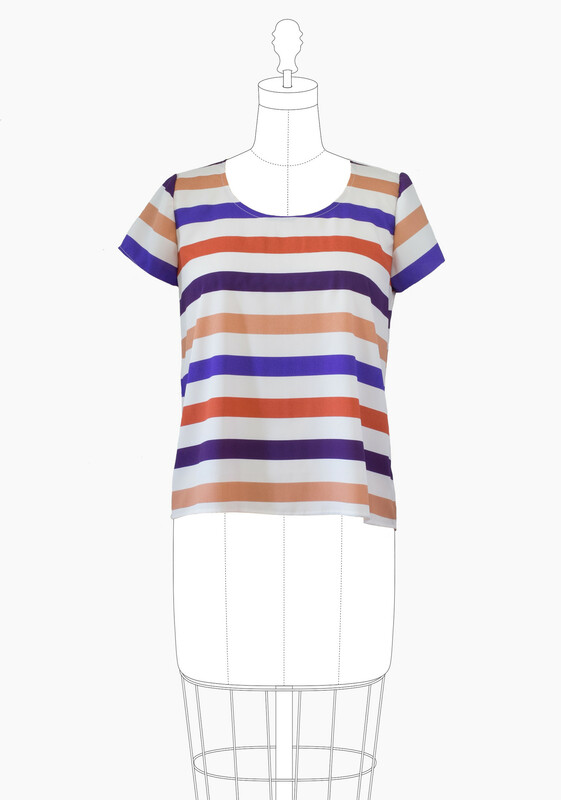 I have to declare that I also harboured secret desires to make a few easy tops to see out summer, things that might go with skirts. Ever since reading You Look Fab’s post on why skirts are so often orphans in a wardrobe (do you think I can find it now? ), I’ve been conscious of how many abandoned skirts I own – too many. All for want of a shorter length top. This pattern is so insanely simple that I felt the burning desire to complicate it. My Princess (name changed to avoid embarrassment when she becomes PM) and I are both generously dimensioned in the bust, so there was definitely going to be a need for a dart. 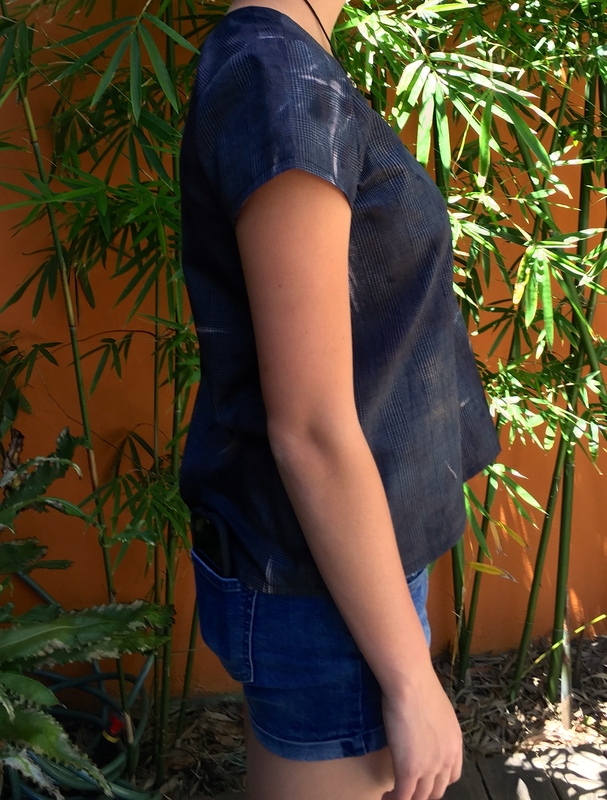 Heck, even the picture of the finished garment on Grainline’s online shop looks like it could do with some darting – yes yes, I hear you, its meant to be an easy fitting woven/stretch tee. I decided to make Princess my crash test dummy in this evil experiment – I can do that because I’m her Mum! Her high bust is 90cm (35.4”) , full bust 97cm (38”) and waist 72cm (28.3”). If I used Grainline’s sizing chart that would mean I’d make a size 12 and would give her 12.7cm (5”) ease at the bust. That would be fine of course, except that Princess would look like she’s wearing a maternity dress because her waist and hips would be swimming in the Scout, due to the 42cm (16.5”) of ease at the waist – whoah! Now can you feel my pain? I Googled full bust adjustments (FBAs) for dartless garments and found an excellent tutorial via Curvy Sewing Collective. My aim was to end up with a similar amount of ease in the bust to Grainline’s original vision – approx. 11.4cm(4.5”), so I chose to start with the size 8 – straight out of the packet no alterations – I wanted a baseline. Predictably the top was ill fitting with only 6.3cm (2.5”) of ease at the full bust and a whole lot of upward hem thrust at the front. The photo below demonstrates beautifully why a pull going from the breast to the hip shouldn’t be described as needing a sway back adjustment! In my opinion, the bust just needs more space – Princess doesn’t have a sway back! Though it should be said that a sway back adjustment might help somewhat. Now if I’m so clever, how come I messed this up? love this fabric – distressed POW check? Next I added a dart via the aforementioned FBA instructions. I made an FBA of 4cm (1.6”), admittedly a bit less than the Grainline ease, I was being cautious. Gotta put a pocket over those dart ends – there’s no fixing them! Have you spotted my error yet? 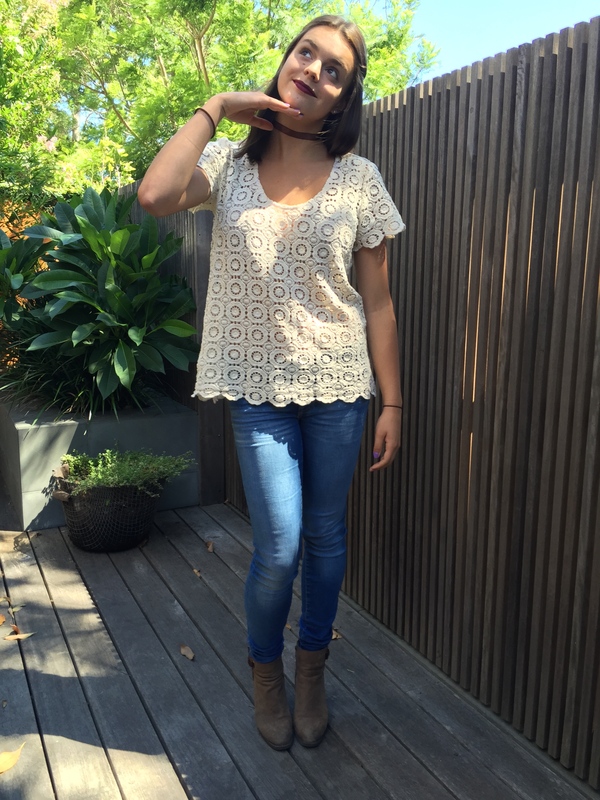 I hadn’t… as I cut and stuck with glee – yippee, I love patternmaking – no really – I do! Now the Scout has a total bust ease of 14.3cm rather than Grainline’s vision of 11.4cm. Not a disaster, but I compounded the problem by using the drapiest rayon voile I could find and made a deep French dart because things might not be tough enough! The first trial was tacked together and poor Princess looked like she was wearing Grandma’s polyester muu muu. – drapey bias disaster. After much prodding, poking and pinning I managed to salvage the #%$*ing thing enough that it is passable to wash the car in. I didn’t take much care sewing the label in FYI – I was quickly losing the will to live, but its a nice stab stitch on the outside! However, I awarded myself 10/10 points for endurance, because then I went on to try another size and a different dart location. Next was a size 10 with a 3.5cm (1.4”) FBA, smaller, horizontal dart this time. No way, was I risking the bias of that French variety again! I tacked it together in a delightfully stableish cotton lace – desperate to have Princess lavish me with gratitude, hugs and kisses for making the top of her dreams (she never requested the bloody thing in the first place remember; she was a crash test dummy!). So now we have an even bigger waist (ease now 36cm (14.1”)) and an even huger amount of bust ease – 15.4cm (6”). Undeterred by how god awful the horizontal dart looked, I hacked a total of 3cm off each side seam tapering to nothing at the underarm and eased the dart allowance ‘cos I’m cool like that and its entirely possible with holey lace. I’m pleased to report that she loves the final version and may not die of embarrassment wearing it. 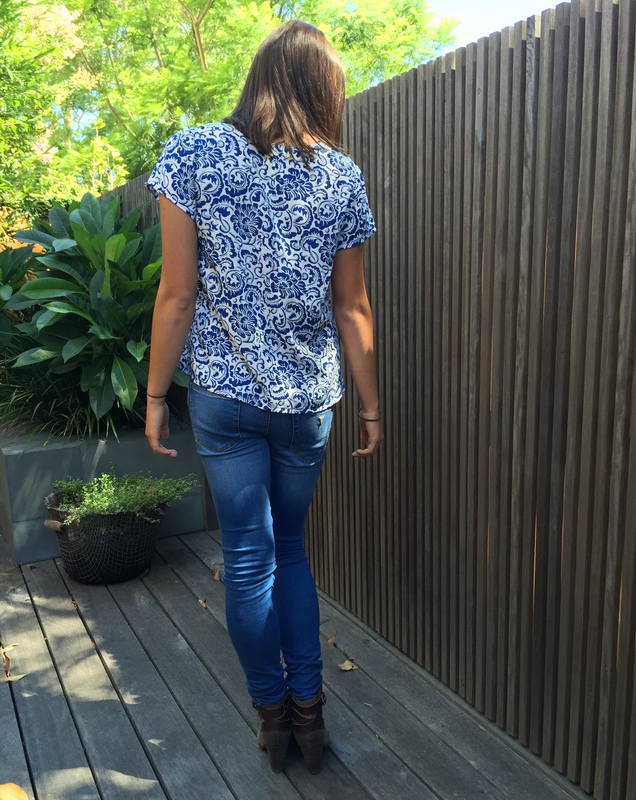 I would shorten it 8-10cm in future, I like her in boxy tops with skirts – she has a beautiful waistline. Interesting that this Granny lace brought out the goth! front neckline lowered about 16cm, stabilised and eased with non bias binding. But, have you spotted my mistake yet? I didn’t halve the FBA allowance – doh! You see a top has 2 darts, because we have 2 breasts, so the amount of increase should be distributed across 2 halves. If I need an FBA of 5cm (2”) I should have made an adjustment of 2.5cm (1”) each side. The dart would have been way more manageable and I wouldn’t need to sweep hair off the floor, left after pulling it out of my head. I do hope this saves you from making my mistake. This experiment was supervised by the Sewniptuck ethics board – no daughter was harmed in this trial. Thanks Kirsten. It wasn’t really the pattern’s fault – I’m an incorrigible experimenter! 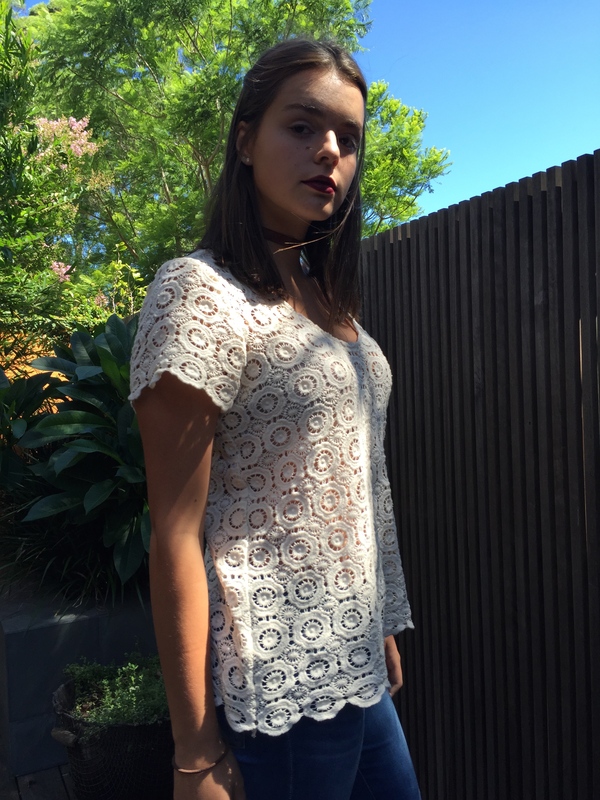 The lace top is a very pretty result for all your perseverance. Thanks so much KaSchu, I’ve put a pocket over the blue one’s darts now! Is there nothing a pocket can’t fix?! You make this hair tearing just sound like an interesting little experiment. I know how much work went into the three Ts are you have ended up with something very lovely. I like all the fabrics. Alot. And your daughter looks like she is definately PM material. Princess for PM – its got a ring Kate! She’s back off to Hogwarts this weekend – sniff, sniff! Thanks for dropping by.